Vaughn Velocity V6 1000i Int. Leg Pads | Sports Etc. The 1000i intermediate model leg pad has a full knee roll style construction for easy flexibility. The new Pro Core design provides a full length and width frontal foam core that keeps the pad consistent in height and width. This design preserves an incredible feel to help control rebounds, which the Velocity pad is known for. 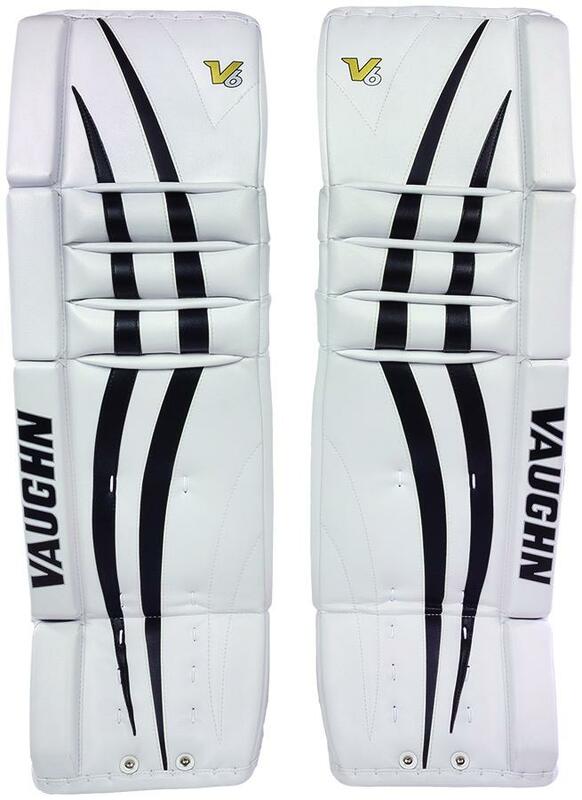 Vaughn Traditional Full Knee Roll Design– Recommended for any goalie looking for a softer faced pad, which allows for flexibility and versatility. All while still providing a firm blocking surface and strong seal on the ice. Sports Etc Performance To Value Rating- 9 out of 10- Arguably our best value for an intermediate sized pad. Great for all ages and skill levels.